The U.S. Navy has dominated the maritime realm and established itself as the world’s premier naval power for over 230 years. Navy challenge coins from US DOD Coins are custom made in honor and reverence of all aspects of the Navy’s ability to successfully fulfill its mission to win wars, hinder water attacks and preserve the freedom of the seas. Much like hidden treasure, Navy challenge coins are precious and valuable pieces that are a tangible reminder of duty, honor, sacrifice, and service. 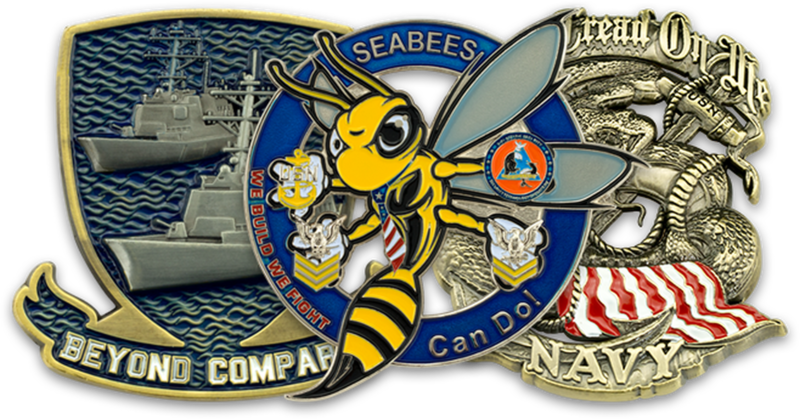 Using U.S. DOD Coin's wide variety of design options, our project with you to create a Navy challenge coin could easily be made to recognize specific teams, units or departments as well as their accomplishments. Much like a successful naval operation, there is a certain level of skill and art(and a sprinkle of finesse) required when creating and manufacturing superior custom coins. U.S. DOD Coins is a leading personalized product and custom Navy coin maker because we employ individuals who are unmatched in the art, skill, and talent that is needed to produce quality Navy Seal challenge coins. If your team or company is on the market for a new Navy Seal challenge coin company that is here to meet your needs exclusively, just know that U.S. DOD Coins has the specialists that you need for this mission!